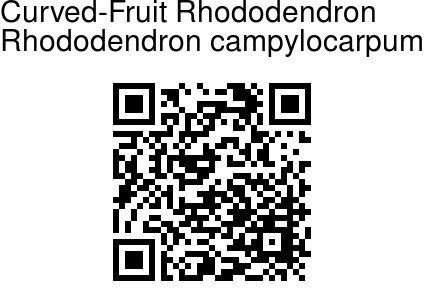 Curved-Fruit Rhododendron is a small bush, averaging 6 ft in height, rounded in form, of a bright cheerful green hue. 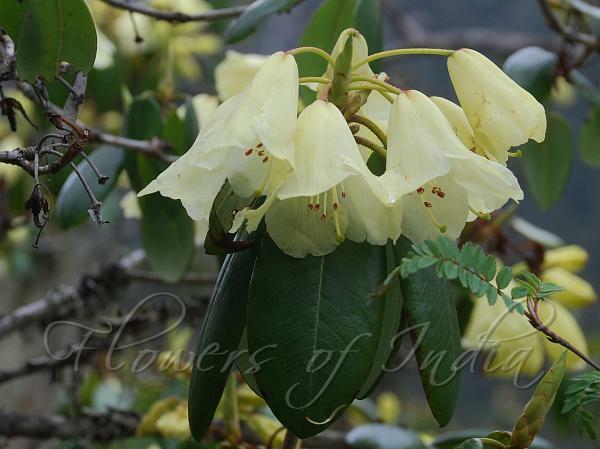 With its inflorescence of grace, has been regarded by some as the most charming of the Sikkim Rhododendrons. Flowers are horizontal and nodding, truly bell-shaped, delicate in texture, tinged of a sulphur hue and always spotless, nearly 5 cm long, broader across the lobes, which are finely veined. The plant exhales a grateful honeyed flavour from its lovely bells and a resinous sweet odour from the stipitate glands of the petioles, pedicels, calyx, and capsules. Leaves are borne on slender stalks, about 2 cm long, leathery but not thick in texture, 5-9 cm long, 4-5 cm broad, heart-shaped at the base, rounded and mucronate at the apex. In all characters, except the evanescent glandular hairyness and spherical buds, it is undistinguishable from Thomson's Rhododendron. The stalks of the capsules radiate horizontally from the apices of the ramuli, and the capsules themselves curve upwards with a semicircular arc. They are about an inch long, always loosely covered with stipitate glands. Curved-Fruit Rhododendron is found in the Eastern Himalayas, in Bhutan, NE India, Myanmar, Nepal and Sikkim, at altitudes of 3000-3900 m. Flowering: May-June. Identification credit: Bharat Kumar Pradhan Photographed in Yumthang Valley, Sikkim.